Your son will love to swim in these Adidas Boys Graphic Swim Boxers - Shock Blue! These swimshorts feature an eye-catching shark print alongside the famous 'adidas' name and 3 stripe logo which your son is going to love! This Adidas swimshort offers the perfect blend of comfort and durability making it the perfect men's swimsuit for your training, fitness and leisure swimming sessions. 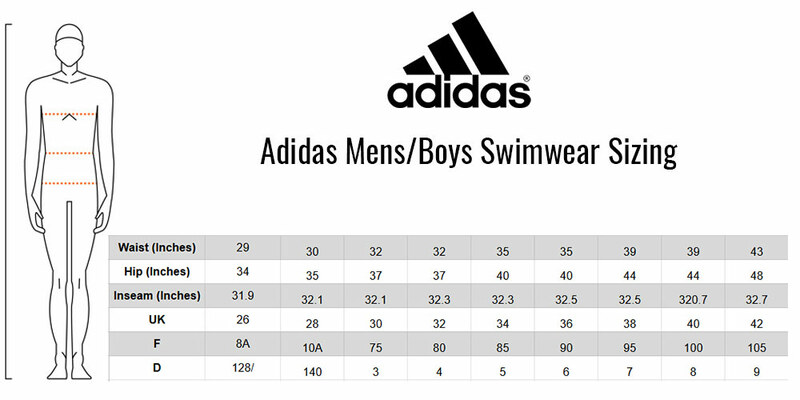 This Adidas adult swimming short offers excellent colour and shape retention properties due to the chlorine resistant fabric it is made from, allowing your swimsuit to look like brand new for longer! The Adidas Boys Graphic Swim Boxers comes in an eye-catching 'shock blue' design and is made from a chlorine resistance INFINITEX®+ fabric which offers excellent protection from UV rays & fading alongside excellent shape retention making this Adidas swimshort ideal for your training, fitness and leisure swim sessions! Durable INFINITEX®+ Adidas Fabric allows this swimshort to last for 100s of hours making it perfect for regular swim training.